mySQLtoes is a simple tool written in php that allows you to duplicate your mysql table into elasticsearch. it's using the elasticsearch PHP API. mySQLtoes reads the elasticsearch and mysql credentials from a config file. you can either choose to use one of your columns in mysql as the _id in elasticsearch or use the default incremental ID. 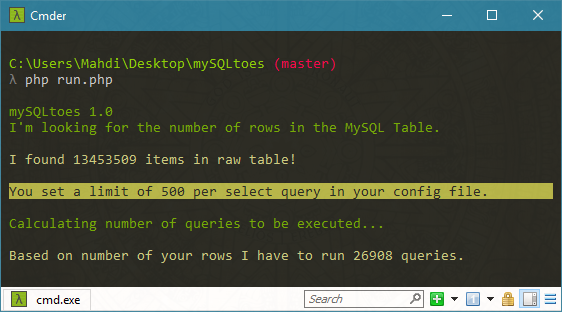 mySQLtoes also allows you to set a limit for bulk select and insert to the elastic search. by this you can select and insert large amount of data to elasticsearch by benefiting LIMIT function in MySQL and prevent your server from being overloaded. Make sure that you have PHP 5.3 or above installed on your machine. Open the configuration file and setup your credentials and execute run.php from command line. You can read more about the installation of this tool in my github page. at the moment it does not set any mapping for the inserted data. however if you are using Dynamic Mapping Templates in your Elasticsearch you can benefit from automate mapping of your data. I'm thinking of adding a mapping functionality in the future, it depends on how much free time I will have to spend on developing it. Latest commits and builds are available in the github page.